In this guide, we’ll introduce you to our picks specifically for quilting. Anyone who’s read our homepage knows that our overall Top Three machines are perfectly good for quilting. These recommendations go the extra mile in that they’re designed specifically for it! Read on to find our in-depth review of three great quilting machines, along with a handy buying guide which will help you narrow down your options! Quilting is the ultimate craft. It’s a pursuit that demands patience and precision, but which rewards you with heirlooms to last several lifetimes. Whether you’re starting your first quilt or powering through dozens in a row for charity, you’re part of a creative and supportive community when you quilt! It’s one of the more demanding tasks for your sewing machine, though. To work at a reasonable pace, you’ll need fast stitch speeds from your workstation. To be able to work on such a large scale, you’ll also need lots of workspace on the machine and table. And when you crank out large quantities of needlework, “reliability” takes on a whole new meaning! Here are a few models that we think are perfect for someone whose primary needlework is quilt-related! The Brother XR3774 is our budget pick for quilters. It’s an easy way into quilting for newcomers, and a very inexpensive option for experienced quilters who don’t need a lot of thrills and don’t want to spend a premium. 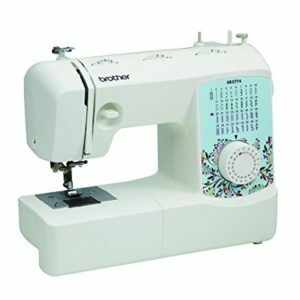 This is a very versatile manual machine that has as many built-in stitches and features as many inexpensive computerized models. It provides a lot of value. While the XR3774 is an excellent little machine in its own right, we’re also enamored with it as a package. For a little over $100, you get a capable, powerful sewing machine and all the accessories you need to get quilting and sewing in lots of different techniques. So, right out of the box, the XR3774 has everything it needs to do quilting projects! In addition to the set of feet, it comes with an extension table specifically for quilting. That gives you lots of space to spread out! We’re also particularly pleased with the quality of the table on this model. A lot of other inexpensive extension tables end up fitting wonkily, and this one is close to perfect! There’s a one-step buttonhole, which automatically resizes for each piece of material. It might not be as sophisticated or have as many style options as more expensive machines, but it’s a great feature for this price range. The Brother also has a quite decent built-in needle threader, and its top-loading, drop-in bobbin loader is jam-resistant. Overall, there’s not a world of difference between this and the computerized models that cost as much as $50 more. The XR3774 is generally as convenient to use, and you don’t have to worry about a cheap computer conking out on you. There are also a whopping 37 built-in stitches! That’s an impressive amount of functionality in a manual machine, especially at this price. You get blind-hem, decorative, and quilting stitches as well as all-purpose patterns and variations. Having specific quilting stitches isn’t a given at this price, so it’s a big selling point for us. The stitch selections are all built into a simple dial. There are also visual diagrams of each on the front of the machine. While that might feel old-fashioned compared to a computer system, the dial beats scrolling through menus on a cheap computer any day of the week! The stitch options are all adjustable in both length and width. Those adjustments are manual and straightforward as well. You can do cuffs, sleeves, and other cylindrical projects thanks to the free-arm. That’s also good for freehand quilting! It’s heavy-duty enough for multi-layer garment construction. You should have no problems sewing a few layers of flannel or denim with the XR3774, as long as you work slowly and use an appropriate needle. That makes it more versatile than other inexpensive models, which are only good for basic quilting and thin materials. It has a great worklight, with an LED bulb. This is one of the most helpful machines under $150 in terms of visibility. It’s absolutely ideal for sorting out your folds and joinery on a quilting project. It’s light, at well under 15 pounds. It’s also compact, with a body sized 17.5 x 7.6 x 14.6 inches. This is an excellent option for beginning quilters to take to class, or for experienced folks who want a secondary travel option that doesn’t have the limitations of a 3/4 machine. It won’t cost you much more than $100! For that price, you get a very decent quilting machine, plus the versatility to handle all-purpose projects. This is a great deal for beginners who want to try their hand at quilting and sewing without making a big commitment. If you’re more experienced but don’t have a lot of money to devote to your quilting hobby, this is a thrifty choice. It comes with a helpful bilingual user manual and an instructional DVD. Whether you’re an English or Spanish speaker, this is an extremely easy machine to learn on. It does most of the fiddly bits of sewing for you. It’s very user-friendly, and not the least bit intimidating! What we like most about this one for new quilters and needleworkers is that it gives new people lots of room to grow. There are so many features on this that you can get a lot of mileage out of it before you need a more elaborate, expensive machine. Since it’s compact and easy to use, the Brother XR3774 is friendly for all ages of quilters. This could be a great option for kids who want to try their hand at quilting! You also get a light cover to keep dust off the machine when you’re not using it. It’s covered by a 25-year warranty and free lifetime phone support. The XR3774, while not as heavy-duty as more expensive models, is also much more reliable than other machines at this price. It’s actually a more reliable choice than some of the more expensive computerized models in the $100-$200 range! This will last you through plenty of quilts! It doesn’t have a built-in thread-cutter. That’s not a huge downside, but it’s definitely a missed opportunity for a user-friendly feature. You’ll to do all your trimming manually and with shears on this model. The pedal isn’t as responsive or subtle as more expensive options we’ve reviewed. That isn’t a big surprise, since inexpensive pedals don’t typically leave a lot of gray area between a stopped needle and full speed. If you’re an experienced quilter who’s used to lots of control, though, it could be annoying. Beginners shouldn’t have any complaints. There’s also no precise speed adjustment feature. Again, that’s not a huge surprise given how inexpensive a machine this is, but experienced folks who like more control may want to spend more for a model that has precision speed adjustments. It doesn’t come with a hard case. If you’re going to be bringing your machine to class, you’ll probably want to buy one separately. The XR3774’s tension adjustments are all manual. We always like a manual override even on an automatic model, but beginners will have to spend some time getting familiar with tension settings and adjustments. It’s mostly plastic, so it won’t last forever. Aside from some quality control issues, we don’t know of any reliability issues with the XR3774. However, it’s very lightweight, and the plastic parts simply won’t last as ruggedly as metal components that you’d find on pricier options. While this is a fairly reliable model compared to other inexpensive options, quality control is lacking. Some buyers reported receiving models with timing issues and internal problems, leading to birds’ nest results or jams. Be sure to test yours within the return window! Other than factory mess-ups, though, the XR3774 is very reliable. The light build does have some usability downsides. First, it’s noisy. Second, it’s more finicky than more expensive and more powerful machines that can smoothly blast through any project. Our midrange pick for quilting is the Brother Designio DZ3000. It’s a computerized model that offers even more versatility than the XR3774! This is an excellent choice for new quilters who want something to grow into, or for experienced quilters who want lots of options. It’s a great all-purpose machine with plenty of room for larger projects. It’s fully-computerized. That gives you far more stitches to work with, for a start. This Brother has 240 in total! Given the fact that you can make easy adjustments right on the computer panel to tweak length and width, the possibilities are endlessly better than on the XR3774. Stitch widths on any of the built-in presets (except the lettering) is from stitch width up to 7 mm and length to 5mm. The computerized system also gives you not one but eight one-step buttonhole styles! It’s pre-programmed with a full alphabet, and a choice of two fonts. It would take up the front and backside of the body to show graphics of each stitch on this machine. Otherwise, you’d have to manually scroll through the hundreds of options. Brother have come up with a handy flip-down chart to give you the convenience of diagrams without having to take up the whole machine or make you look in awkward places! It’s really great! It has a nice big display and control panel. The display in particular is a lot more generous than other models around this price, which comes in handy when you’re keeping track of each quilting stitch. It shows your stitch and your adjustments all in one place! The DZ3000’s automatic needle-threading system is better than the XR3774’s. It works more reliably, and is again a one-touch setup. It has a quick bobbin-winding system, and the same jam-resistant drop-in system as the XR3774, too. It’s powerful! This thing can sew up to 850 stitches per minute. When you’re powering through a long-haul quilt, that kind of speed boost is welcome. This is more suitable for a confident quilter than the XR3774, at least where speed is concerned. A super convenient upgrade with this one is a start-stop button right on the body! That allows you to control things without the pedal. You can also control the sewing speed precisely on this one, thanks to an easy slide switch. That’s not possible on the cheaper model. On the whole, the DZ3000 offers a lot more customization and adjustments than you can get from the XR3774. That’s why we think it’s a better choice for intermediate and advanced quilters who know what they want! You can branch out in pretty much any direction on this machine without running out of options. It comes with a more versatile set of feet than the XR3774. This one’s standout attachment isn’t actually a foot. It’s a unique circular sewing attachment is super convenient for creating dot details on quilts! We absolutely love it. If you haven’t played around with dots before because they’re so hard to sew perfectly, this is a game-changer. 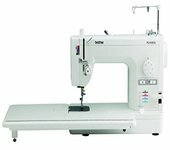 As with the XR3774, the DZ3000 has a built-in free-arm for cylindrical projects and free-motion quilting. It’s actually hidden behind the accessory tray, right on the body. It offers lots of workspace: 5.7”H x 3.8”W.Like the XR3774, the DZ3000 comes with an extension table as well. Unless you’re going to get a dedicated quilting machine like the one we’ve recommended below, it doesn’t get any roomier than that! It comes with a hard cover and a storage tray for your accessories. Also like the cheaper model, it’s highly accessible. The computer system is way more intuitive than the older Brother’s, and is simple for young and old users to learn. It comes with a bilingual manual in English and Spanish. It’s heavier-duty than the XR3774! This one has a bigger motor that won’t bog down as easily. It offers even better performance on thicker and layered materials, and the whole thing feels a bit sturdier in hand. The sophisticated 7-point feed dog on this model does a better job adapting to changes in texture or thickness as you work than the one on the XR3774. So, if you’re making lots of layered designs on your quilts, this is a much better choice! It’s a bit quieter than the XR3774, thanks to the heavier build. As with the cheaper Brother, the DZ3000 is covered by a 25-year warranty, lifetime phone support, and a very good reputation for reliability. It’s not as heavy-duty as the PQ-series below, but it’s a good deal better than other computerized models at this price. We think it’s a better choice for people who do quilting and sewing on a daily basis. There’s no automatic thread-cutter, which is definitely a mark against this when you compare it to equivalent Janome offerings. We’re still recommending the Brother because it’s roomier and comes with more quilting features, but that’s our main quibble with the DZ-series. While this machine has a multitude of decorative stitch options, it can’t stand in for your embroidery machine. If that’s something you’re looking for, look at our embroidery recommendations! Several are perfectly good at quilting, and will give you more elaborate options for finish work. 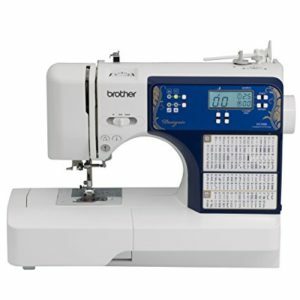 We generally recommend Brother machines for quilting because they offer so much space to work, and so many specific quilting features. The disappointing thing with this model compared to similarly-priced Janome’s is the build quality. This Brother is three times the price of the XR3774, but it’s still made mostly of plastic. It offers fantastic functionality and versatility, though, and while we aren’t thrilled with the feel of all the components, the DZ3000 has a nearly spotless reliability record. You can’t adjust the size of the lettering. It’s about .5” height, and there are no lower-case letters, either. If you’re looking to do more elaborate lettering and monogramming, have a look at the Janome or Juki in our Top Three, or check out our embroidery recommendations! As with a lot of other Brother’s, it has cheap quality control. That’s the only real issue with this model, and it’s just a matter of checking and testing your machine thoroughly when you get it. Make sure you find any factory issues before your return window is up! This particular Brother is the most distinctive of our three recommendations. It’s a dedicated straight-stitch quilting machine! What it may lack in versatility, it more than makes up for in power, speed, and ruggedness. We think this is as good as it gets for the serious quilter, unless you want to spend thousands for a long-arm setup! It’s by far the fastest of the three. This outstrips most machines on the market, at 1500 stitches per minute! That’s just what the serious quilter ordered. You can power through quilts in half the time it would take you on one of our other recommendations! The sheer power of this thing also comes in handy on thicker, layered pieces. It’s nigh on unstoppable, even if you’re using strips of denim or other tough materials on your quilts. It’s heavy and sturdy. This is a big, hefty machine that doesn’t move or shake at all as you work. It holds everything in place as you work on larger pieces, and feels unbelievably smooth compared to the two models above. The harp gives you an absolutely massive workspace. The PQ has a 8 3/4” throat width, so quilts are no problem at all. You also get a 12”x18” extension table, which makes it easier to work on bigger pieces of your project. It also makes final assembly a lot easier! There’s a variable feed dog system with adjustable levels. They work very smoothly, and they don’t bunch up at all. There’s also an excellent color coding system with the feed dog settings and the foot position dial so that you can keep the 4 options coordinated. It’s a simple but well-executed design touch that makes this one more pleasant to use. You can drop the feed dogs for free-motion quilting, which is surprisingly easy on this machine! You don’t have to worry about getting ahead of a machine this faster and you have plenty of throat space to maneuver. You can adjust the stitch length via a big dial on the front of the machine. It’s adjustable up to 7mm. Unlike our other quilting picks, which don’t have thread-cutters at all, the PQ1500SL cuts thread automatically. It’ll end each stitch neatly for you! Over the course of a big quilt, that’s a lot of time saved. You can switch that feature on and off with a simple button as you prefer. The needle position adjusts automatically! It’s attached to the foot/feed dog adjustment system, so it’ll always be in sync with the other components. The overall effect of all these components is a machine which stitches fantastically. It leaves neat, even, and consistent stitches at any length and on any material you’d use for quilting. If you’re a serious, competitive, or even professional quilter, this is the machine for you! Even though this is primarily a quilter’s machine, it’s perfectly up to clothing work if you’re comfortable doing free-motion stitches. The power and smoothness you get on the Brother can easily handle leather or flannels. Just don’t try to do anything too complicated. It’s all-manual. If you’re an expert quilter, this is absolutely ideal. No service calls for computer errors! As long as you know how to do things like tension adjustments, and take the time to adjust your instincts to the Brother, you should be perfectly happy. The 1/4” foot has a specific marking so you know when to turn your corners for binding. It’s a perfect little touch that helps to make this feel like a true “quilter’s machine” rather than a machine that can be used for quilting. You also get a complete set of notions and an owner’s manual, as with our other quilting picks. It has a good work light which is bright enough to illuminate the whole surface area. We don’t think you’ll need any attachment lamps on this one. There’s a knee-lift feature to lift the foot. That’ll only work if you’re going to fix your machine to a table, but it’s an excellent extra! Overall, we think it performs far above its price bracket. This is comparable to lots of machines that cost thousands of dollars. Its speed, smoothness, and precision are really remarkable. It will last for years of daily quilting. This is a true workhorse model! In terms of build quality, it’s astronomically better than the cheaper Brothers above! It’s covered by the same 25-year warranty, but you’re far less likely to need to use your warranty with something this solid. It’s an oiled machine, but Brother have taken the annoyance out of that feature. It has little holes to top up the oil, so you don’t have to take the machine apart! Tension issues can be a problem, if you’re not careful. The triple thread system can be hard to get used to at first, which has left some buyers frustrated. Thankfully, there are easy tweaks for this machine online. It’s just a matter of getting used to it! Likewise, it’s harder to use the bobbin system on this model than our other recommendations. It’s an old-fashioned style side-loading system, not the more common modern drop-in Brother feature. You’ll need to get used to it, if you haven’t used something with this format before. There’s no thread level indicator for keeping track of each bobbin, either. You definitely need to spend time getting to know this machine. It’s not like most others, and many reviewers who have had complaints with this one don’t seem to have read the manual thoroughly, particularly the troubleshooting section. We found quick fixes to all the common complaints we found in other reviewers’ feedback. Unless your only sewing projects are quilts, you probably want a different machine for your primary workstation. A straight-stitch machine like this isn’t going to help you with clothing projects or other more complicated applications. It’s pricey for the casual user, especially considering you’ll probably need to have another machine too. We only recommend this to the serious quilter! Since it’s quite large, this isn’t going to be easy to send back if you have an issue after the warranty period. We’d suggest going with an extra/third-party plan if you don’t live near a Brother dealer/repair shop. The PQ’s weight (~30 pounds) is great for working consistently, not so much for moving it around. This is definitely not a machine you’d want to carry around. Make sure you have a dedicated workspace for it, and don’t plan on bringing it to a group. Depending on the type of thread you use, you may find that the auto-cutter leaves too little after the end of a stitch. That just means you’ll need to flip the auto-threader lever again, but it is an additional step. However, the manual does have some troubleshooting tips which we found very helpful. The threading system isn’t intuitive. It’s straightforward, though, so it’s mainly a matter of getting used to it. Just don’t expect to thread this like a standard machine! Which of our three quilting picks should you buy? The Brother XR3774 is the clear choice for budget-minded quilters. It’s a very accessible model for a new quilter, and offers lots of room to grow. This is also a super affordable option for experienced quilters who don’t need lots of extra features and don’t require something particularly heavy-duty. We like this one a lot as an all-purpose machine, too, so it has excellent value. Just don’t expect it to last forever or to work as quickly or smoothly as the more expensive options here. The Brother DZ3000 offers the most bang for your buck of the three. It has several times as many stitches and features as the XR3774, and faster stitching speeds to boot. It’s roomy, intuitive, and quite reliable. We think it makes sense for intermediate and advanced quilters, if not a professional or competitive needleworker. Don’t get this if you don’t like computer systems, though! It also has the same flaw as the XR3774: light build quality. The Brother PQ1500SL is by far the best machine for quilting here. The major caveat is that it’s not very good for other applications. We recommend it to anyone who wants a dedicated quilting machine, and who can afford something this expensive. It’s extremely powerful and makes for fast, neat quilting. While there are certainly more expensive models out there, we think it’s as nice as any serious quilter could need, short of a long-arm model. 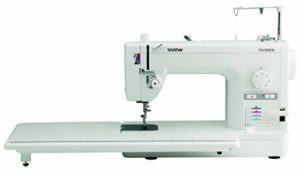 *We’re recommending machines on this page specifically for quilting. These models are versatile enough to tackle other projects, but if you do lots of other types of stitching and crafting, you may want to go with one of our Top Three all-around recommendations. Find them on our homepage! Quilts are large projects by nature. While you can work on sections easily enough on a compact machine, that’s an impractical way to do multiple quilts. Plus, when it comes to joining all your sections together, you really need to be able to spread things out. Look for wide workspaces on the machine itself, as well as an extension table in the box with your machine. You want as much room along the throat as possible, as well as space to spread out horizontally. The more, the better! If you’re going to be building your machine into a table or favorite extension wing, you may not need to pay as much attention to the workspace and extension table that come from the factory. Just make sure the size of your new machine is compatible with the workspace you’ll be using it with! Quilting machines aren’t necessarily any more or less expensive than any other sewing machine. That’s good news for you, because there’s a wide range to choose from! Here, you’ll want to think about the same things you’d think about when shopping for any sewing machine. How much use will you get out of your machine? How skilled are you at quilting? Will you be entering your finished pieces in competitions, or trying to sell them? If you’re looking for the most value, choose models with lots of suitable accessories and features, so that you can get more quilting bang for your buck! These machines are primarily recommended in this guide because they’re great at quilting. The flip side of that is that they’re not necessarily the most versatile machines on the market. As you decide between them, this about whether you’re shopping for one primary machine to do quilting and all your other projects, or for a dedicated quilting machine. If you’re going to be buying a primary machine with quilting in mind, make sure it also covers all your other needs. Think about the full spectrum of what you want to achieve. Do you want to do garment projects and other tricky applications as well as quilts? What features do you need? Do you have another machine already? What kinds of features would help compliment your primary machine in your quilting machine? Can you justify buying a separate straight-stitch machine just for quilting? If you don’t do much of anything besides quilting, it certainly makes sense to shoot for a straight stitch machine. If you’re a versatile needleworker who does a lot of side projects, you should buy something more well-rounded. Quilts are time-consuming projects, so do yourself a favor and get a machine that won’t slow you down! Look for high stitch speeds, and specific quilting stitches/accessories to make your workflow more efficient. The more you quilt, the more time you can save by investing in a nimble, well-equipped machine. You never want to work on a machine that goes too fast for you. However, you do want to get something that can go as fast as you can work, and slightly faster. As long as you can adjust the speed down to your working level, you’ll be all set. So, the faster the machine, the better it will be for quilting! Whenever you deal with the sort of yardage that’s involved in quilting, you put lots of wear and tear on your sewing machine. That’s why reliability is so important when you get your new quilting station set up! You need to choose a machine that’s built to go the extra miles! We’ve taken care to recommend models with excellent reliability for this guide (as with all our other guides). You don’t need to worry too much about any of these machines letting you down. However, if you quilt every day, you wouldn’t want to expect the cheaper machines on this page to last as long as one of the more expensive options. Look for long warranties on any quilting machine, plus some extra third-party protection at the checkout if you want to avoid the hassle of going to a dealer. If you’re not sure if there’s one nearby, check out the company’s website for a dealer locator. While many quilters work exclusively at home, some of us like to go to group meetings and quilt with other craftspeople. If that’s something that you can see yourself doing, you’ll want to think about buying a machine that’s easy to pack up and get in the car. You might also consider one of our Mini or Top Three picks as a more portable alternative to these recommendations. If you’re still interested in doing lots of quilting, but want something more versatile than these picks, try one of our all-around Top Three recommendations on our home page! They’re all quilting-friendly, but they’ll also give you more range from your machine for other projects. If you think one of these recommendations is a good fit for you, you can see more details by clicking on any of the links in its review! Or, if you’re still searching, you can have a look at the best-selling quilting machines here!